When I started this project, I had never sewed a quilt before. I used to sew those sewing tutorial kits for kids when I was in elementary school but I often quit after a day or 2 due to my impatience. I know the basics of sewing thanks to my mom but I had no idea how to sew a quilt. I did not know what the process was, what fabric to use, the quilt terminology for the process, and I had no idea how much time it would actually take me to finish. I understand every person is different and works at his/her own pace, but I know I am a person who takes my time and does not rush through something. I am not OCD or a perfectionist, I just do not like to be rushed and it is better to have a nicer product through patience than rushing through it and the result is not your best. I started this project with high hopes I would create a beautiful one-of-a-kind quilt full of color and proof of my hard work. I started the project with high expectations that I would overcome my lack of patience and further develop my skills in the sewing department. I was up for the challenge but one thing that beat me during this project was time. I started off strong with sewing the front of the quilt but the many challenges in April (TPAs, lesson planning, etc.) threw me off-track and it was difficult for me to complete the project. In addition, my mom’s sewing machine (from the 1970s) died during the making of my quilt and I cannot afford to buy one. I looked around and there was a sewing place called Quilt in a Day. They offered to rent a machine to me for $7 to use in their store but every time I went, the regular ladies in their late 50s-70s were in the sewing rooms and there were no more machines to rent out to me. This became a frequent occurrence. One of the ladies offered to finish the quilt for me if I paid her money but I politely refused because it would one, be dishonest for this project, and two, it is not the same unless you do it yourself. Though I still need to finish sewing the batting (middle) and backing (back), I may not have sewed a full quilt but it is rather remarkable for me to have taken time to start the quilt and I am determined to finish even though it will likely be finished after I finish the program. This is a project I want to see completed and though I need more time past the time to finish for this class, it will be done I guarantee it. I know I could have done better and accomplished more in sewing this quilt but as a teacher and lifelong learner, failing is a big part of the learning process. Though this project was important to me, I felt my decision to put the students, my responsibilities, and TPA 3 and 4 before the 20% project was the right decision. Even though I didn’t accomplish my goal for the 20% project, I felt I learned a lot about sewing, the process of making a quilt, and how to use a sewing machine. I was taught how to sew by hand so using a machine was a new challenge for me, especially refilling the thread and bobbins. I felt I learned more about sewing and quilting my own way even when I was following advice from online tutorials from YouTube and Pinterest. I have improved my level of patience by participating in this project and I feel this helped me be more patient with my students. The project spurred me into buying quilt fabrics, proper fabric scissors, batting material, thread and other supplies. These supplies will be useful for me to finish the project and when I or my mom need to use them for other sewing projects. I need to invest in some thimbles so I do not cut myself like I mentioned in my blog. I felt I was able to address my inquiry questions I had at the beginning when I was getting started. I did have questions throughout the sewing process of my quilt and I was able to figure them out with the help of the tutorials/research. My enemy for this project was time. I chose a project where time and patience is imperative to complete a quilt, as well as a proper sewing machine. I was unable to complete the project not because of the sewing instructions/process but because of the amount of time needed that I did not have (I stay at school to plan after school hours and do homework) and the sewing machine I was using could no longer be used. I have a beautiful front to my quilt, I have the batting and backing fabric, sewing supplies, and I will have to get my hands on a proper sewing machine. Maybe I’ll bribe one of the sewing ladies to stay home for an afternoon so I can have a space to sew. One of my initial reasons for choosing a quilt is that I wanted to overcome my low level of patience and not give up. Though I did not complete my quilt yet, I feel I have accomplished this goal because I still plan to work on the quilt and see it complete. I have not tossed it into the trash or put it in a bag stuffed in the back of my closet. It is a project I want to complete at my own level and speed. I do not want to rush through it and have it be a quilt that falls apart quickly or cannot be used. 1. How much fabric do I need to make a quilt? I chose to do a lap size quilt and the measurements are 34" by 47 1/2". 2. Are there different quilt patterns and sizes for beginners? There are some websites that offer quilt patterns for beginners but it is really up to the individual. They recommend a patchwork quilt and there is no size for beginners. However, it is recommended for beginners to use the size, Twin, XL Twin or Lap quilt to start out with before moving up to the larger quilt sizes like Full, Queen, and King. 3. What website blogs or videos will be the best tutorials for me? I found that Pinterest sewing tutorials and step-by-step YouTube videos worked the best for me. I was able to listen and see the sewing instructions and I could always replay video if I needed to. 4. Would it be helpful to join a quilt club? I chose not too join an official quilt club during my 20% project. I found myself sewing at odd hours and usually clubs meet at someone's house or a sewing store. I felt I did not have room in my schedule to attend a weekly quilt club. It is a good idea for more long term projects though. 5. What pattern should I choose for my quilt? I wanted to do something related to Disney at the beginning but I wanted to incorporate beautiful variety of colors. 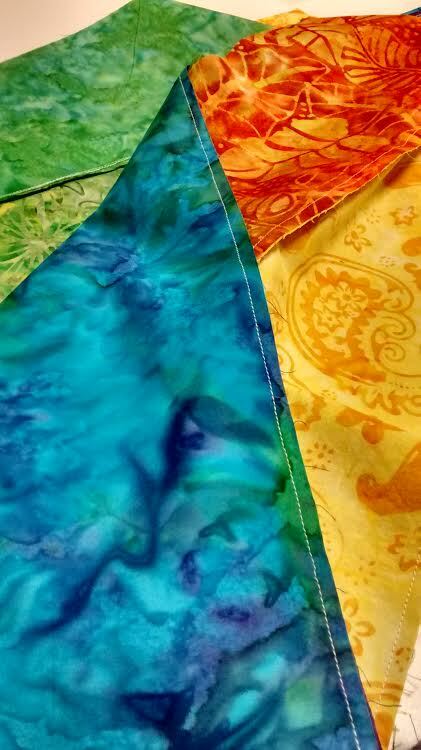 For the front of my quilt, I decided to do more of a rainbow spread of colors using different color shades. 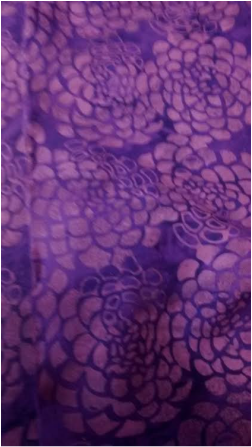 For the backing (back of quilt), I decided to go with a indigo purple with flowers pattern that was simply and did not take away from the brightness of the front. 7. Do you just use needle, scissors, and thread, or are there other tools? I found that you need numerous bobbins and spools of thread for the sewing machine, a flat square ruler, sharp fabric cutter and scissors, steam iron and ironing board, pin needles to hold fabric in place, and a wide space with a flat surface to keep everything organized. 8. Where do I buy fabrics and materials? How much will it cost?﻿ I was able to acquire some of the materials from my own home like the sewing machine (until it died on me), iron, ironing board, ruler, pin needles, thread and bobbins. But I had to pay for the fabric, the batting, fabric scissors. All in all the materials I had to buy including the fabric and batting cost me a little over $100. If I was able to rent a sewing machine, that would have been $7 a session but the sewing regulars were hogging them. I did my homework and shopped around for fair prices so I wouldn't pay a ridiculous amount for supplies. The experience and memories of making a quilt and using it is priceless. 9. What kind of thread do I use? Higher quality cotton thread and I used white because cheap thread can break easily and give off lint when washed. 10. What can I do to make sure my impatience doesn't get the best of me so I do not quit? I admit there was a few times where I wanted to quit because the sewing process was taking forever. I kept telling myself I was not going to quit, I was making something beautiful, and I made sure to take stretching breaks to give my hands and mind a rest. 11. How helpful will social media be? I felt social media i.e. Twitter, Weebly, Google+ were helpful because it was nice to see the encouragement I received from the other teacher candidates as well as Jeff and Leigh. It was helpful to use Internet resources for advice, tips, secret tips, videos, and pattern ideas. 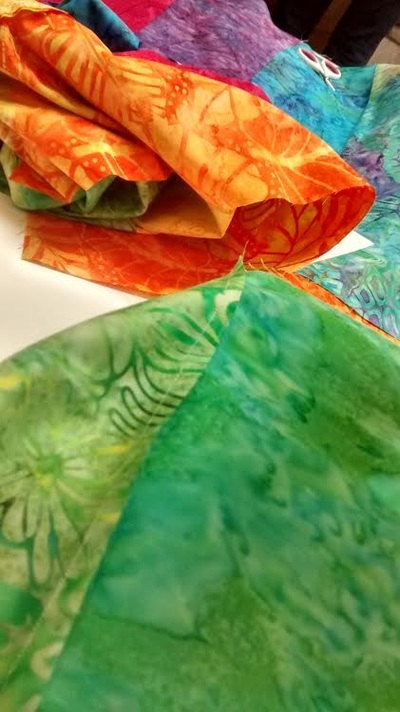 Though I was working on the project by myself, I felt I had support from numerous sources especially if I was struggling to sew a part of the quilt. I could easily go on a video and watch them as a guide. With the TPA #4 complete, I tried to start sewing again as a way to calm my mind and be closer to finishing my quilt. I said a little prayer and fired up the sewing machine to only have it cut out on me after an hour of sewing. I knew I couldn't finish my quilt this way so I looked online of places that rented out sewing machines. I found a few places by my house and I settled with Quilt In a Day. I called up the store and they told me to come in and I could rent a machine for $7 a day to use in store. They told me they had room so I packed up all my supplies, fabric, and quilt front and drove over to the store. I went in and there was a long line in front of me. By the time I got to the front, they told me they had no room for me to sew because some sewing groups had rented all the sewing machines for the weekend. I was mad because I said the person on the phone said there was space and there was no mention of groups that come in on weekends. One lady heard my predicament so she offered to sew the batting and backing to my front for me for a fee but I politely declined. I felt it would be dishonest but it is also not the same as making a quilt on your own. So I went back home to start sewing by hand but I realized this would not be completed by the time the class ends. I'm new to sewing by hand since I have done very little sewing by hand (sewing buttons, fixing a hole) throughout my life. I am proud I have learned the skill of sewing by machine and improving my sewing by hand but I knew that my sewing pace would not lead toward completion of the project. I have come to realize I will not complete the quilt on time, but I have chosen to continue sewing at my own pace and I will not give up. I plan to reassess my personal goals for sewing my quilt and hopefully completing my quilt sometime in June or July once I have finished school and I have more time to sew and hopefully beat the old ladies to the sewing store or have better luck finding a sewing machine secondhand. This will happen after the deadline for this project so I will say I failed to complete my quilt in the time allotted. However, I accomplished learning a new skill, putting time and energy into a new project i.e. quilt, and I will continue to work on it and I have not lost my patience or given up completely. I still have work to do but this was due to putting some priorities and responsibilities above others. I should have tried to select another project that I could work on while at school such as a new diet or juice fast. Choosing an activity that takes up a lot of space and time was my decision. I wanted to try something new and I have always enjoyed seeing the beauty and detail in quilts. I wanted to make one for myself rather than buying one at the store. I will sew more in the next few days when I get home from school and post a final reflection. I am sad to say I do not have much to add to this update on my 20% Project. I have hit a barrier regarding time and my mom's sewing machine is starting to run low on juice, granted it's secondhand from the 1970s. I started trying to sew the batting to the front of my quilt but it seems the essence of time is combative. I have been overwhelmed with stress and lack of sleep due to my long weeks of student teaching, grading assignments, planning student-centered lessons, coursework, and just surviving TPA #3 and starting to prepare for TPA #4. I feel right now what I have just mentioned are my top priorities right now, even though I am really discouraged I have not finished my quilt yet. I also cannot afford to buy a new sewing machine so I will try to find some alternatives to my slowly dying 1970s sewing machine. 1. Sew the rows. I began the front of my quilt by sewing each individual row of pieces together. The lap quilt has given me 14 strips and I will arrange one strip to each color in the Color Wheel order. I numbered each strip 1 through 14 and divided them into pairs. I flipped the second (even) strip right sides together to the first (odd) strip. Once all strips are paired and facing each other, I used a straight stitch on my sewing machine to sew a 1/4-inch inseam. I basically sewed all pairs assembly-line style. 2. Sewing Pairs into "Circles"
After sewing the pairs together, I brought the first strip to last strip with right edges together and line up top edges. It helps to pin edges together to keep the fabric intact while sewing them together with 1/4" seam. 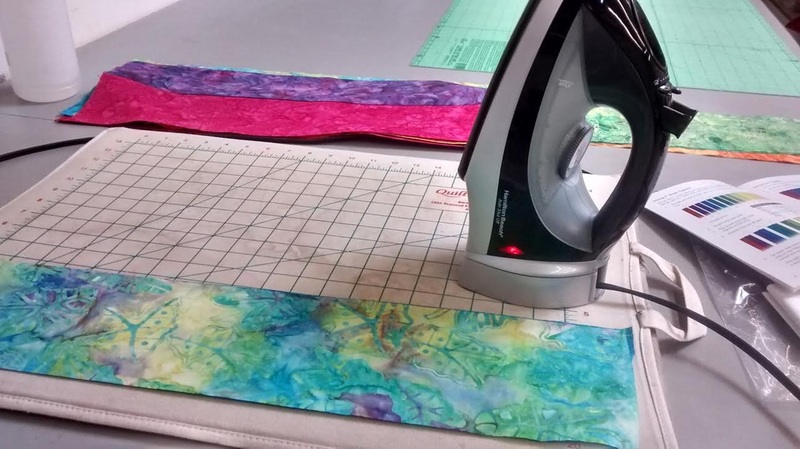 After sewing the pairs into "circles", the next step was cutting them into "Tubes" with the help of a 6" x 24" Ruler and a rotary cutter. - Lay the "circle" on the cutting mat and fold it to the ruler's length. The left edge must be straightened. -The number of 5" "Tubes" I cut for the Lap quilt are 8. -The remaining half set was cut into 2 1/2" "Tubes" for the Narrow Border. TIP! When using the rotary cutter, I read it is best to use the hand you write with (my right hand) to firmly cut the fabric with the tool. The other hand which happens to be my left is to press down on the ruler and cut the fabric in thirds. I cut 1/3 of "tube" then I inched my fingers up higher on the ruler and without lifting the blade, I continued to cut and I moved my left fingers up higher and finished cutting with my right. It is advised to NOT lift the rotary cutter from the fabric because it could snag/ruin the fabric. Love how crisp and flat my strips are. Love the colors! Step 4 is to pick up one "Tube" which will be folded in half by Square #1 and will be cut in half with fabric scissors. The next step is to open and place right side up and I had to make sure seams all go down. -The third "Tube" was selected and I folded square #2 in half and locked the seams. I cut this in half with scissors and placed right side up beside others making sure seams go down. - I continued this until all 8 "Tubes" have been placed. -I placed the background strip between the first and second rows. 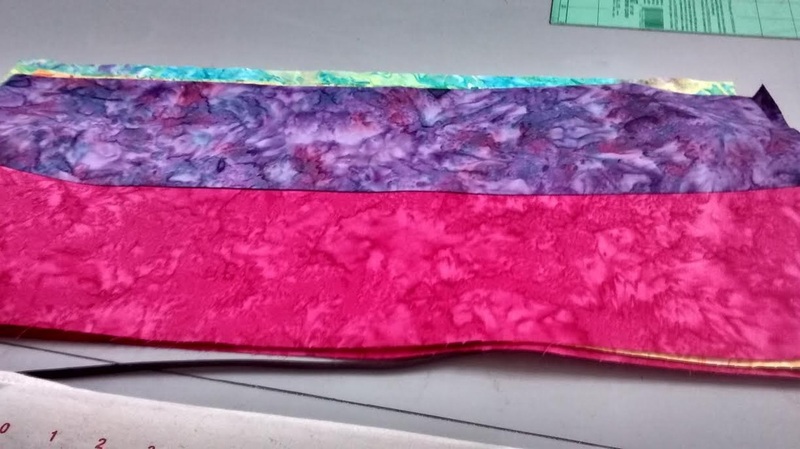 Each background strip measures 3 1/2". -I continued the process of separating rows and placing Background strips between each row except the first and eighth strip. -To avoid messing up, I used pins to hold the rows until it was time to sew each row together. The fabric I have chosen made of 100% cotton fabric. I have chosen several different fabrics for the front of the quilt and the border. I have chosen 1 primary fabric for the quilt backing and I am still deciding what material to choose for the batting (layer between the front and the backing). It will likely be a cotton material. I read it is recommended to prewash the quilting fabric. 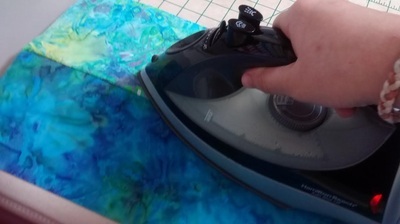 Here is an image of my fabric being washed because I want to rinse out any extra dye and remove any grime. 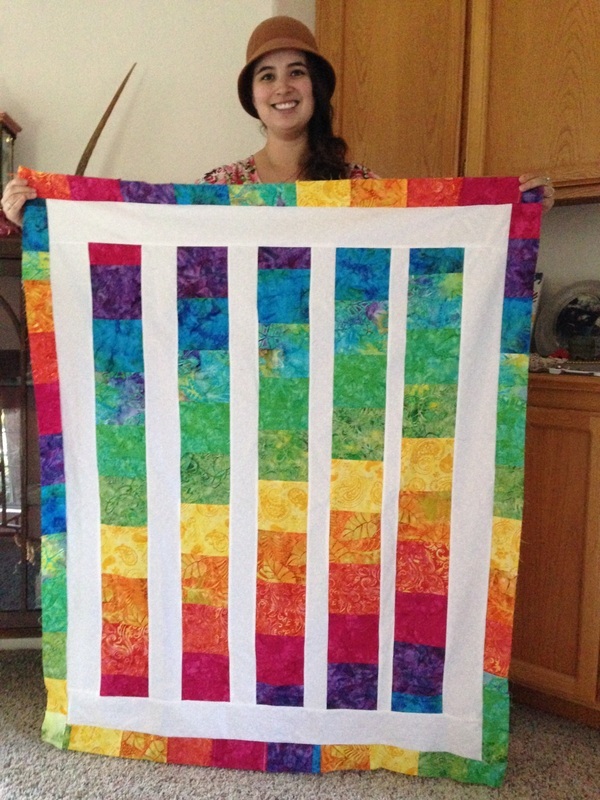 The length of may quilt is Lap which is 51" x 61". The color wheel strips will be cut from the fabric into (14) fat quarters which in turn will be cut (3) 5" x 21" from each. The background strips will be 1 1/2 yards: (6) 4" strips will make up the border and (2) 3 1/2" strips while setting one aside. The binding will need to be 5/8 yd and cut into (6) 3" strips. The backing fabric will need to be 3 1/2 yards and the batting will be 59"x 69". Once dry, I pressed the material with a hot iron. It helped remove any wrinkles and I read it makes cutting easier. The batting does not require ironing but the fabric for the front and back of the quilt definitely needs it. Stacking the rows is the most convenient way to lay out your pattern rather than having a giant quilt pattern laid on my floor or table. It stays out of the way and it lowers chance of getting messed up or dirty. What are the basic quilting definitions or lingo I need to know? 1. Backing: the bottom part of the quilt, typically made of one solid piece of fabric. 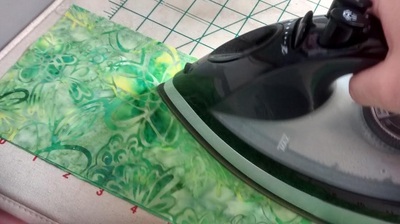 Most times this fabric is white - I like to use sheets for this! 2. Batting: the cushy middle of a quilt - can be made from cotton, polyester or wool. Typically bought according to the size of the quilt you're making - found in rolls. 3. Bias-tape: strips of fabric used to bind the edges of a quilt. 4. Binding: the edging of a quilt - it encases the raw edges. 5. Blocks: a piece of fabric made from sewing squares together. 6. Piecing: sewing together pieces of fabric to form the top layer of the quilt, typically done in blocks. 7. 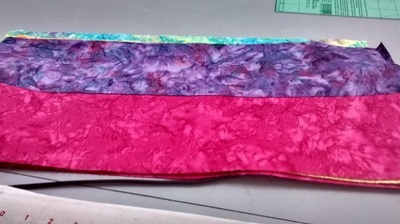 Quilt sandwich: The three layers - top, batting, backing. 8. Quilt top: pieced fabric, typically put together in blocks. 9. Quilting: sewing through multiple layers of fabric to create one thick layer - typically involves three parts: cloth top, batting middle, cloth bottom. 10. Seam allowance: the standard seam allowance for quilting is 1/4 inch. 11. Square: smaller pieces of fabric that are sewn together to make a larger, square piece of fabric. In this case, we will be sewing together 9 small blocks to make one large square. A quilt top is made up of these blocks sewn together. I would need to acquire micro-tip scissors, an Ergo control rotary cutter (45 mm), a cutting mat (18" x 24"), Razor-edge Softgrip Scissors, a 5x24 transparent plastic ruler, straight pins, safety pins, seam ripper, high quality cotton thread, fabric squares/patterns, cotton batting (filling), iron and ironing board, sewing machine and walking foot for the machine, and the sewing pattern instructions. What are some qu﻿ilting patterns to choose from? I saw these quilts online and I thought these would be great to choose my final pattern from. You can see the different patterns in the slide show that I really liked and believed each one would be fun yet challenging to make. I did not want to quit this project and I decided the pattern on the right is the pattern I want to make as my quilt. Now it's time to start sewing my quilt!!! Above: This is the pattern I have chosen for my quilt! I love the use of all these bright and vibrant colors and I cannot wait to make this beautiful quilt. This blog reflects the process of a 20% project I am in the process of doing. I hope to learn from this experiment with the ultimate goal of implementing patience and perserverance into my classroom. Follow Renee Marquis''s board 20% Project Research/Resources on Pinterest.